How to create a large vegetable garden with a one-bottom plow. First, stake out where you want your large vegetable garden to be. 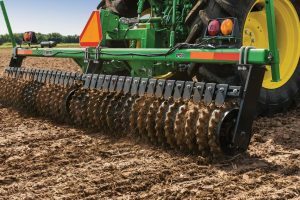 If you’re planning on using a plow attached to your tractor’s 3-point hitch to break that never-been-broken-before soil, then you’re probably planning to create a garden that is at least 30 feet (9.1 m) wide by 50 feet (15.24 m) long. That area is called the “land.” The ground just beyond the end of the furrows you’ll plow is called the “headland.” Make sure you have enough headland space at both ends for your tractor to turn around comfortably to make the return passes. About 10 feet should do it.